Hiram Edmund Deats (1870-1963) was an important figure in both the philatelic world and the library world which makes him of special interest to a collector of postal librariana. I wrote a previous post about Deats on March 12, 2011. This post is prompted by my acquisition of two artifacts that relate to the interest of Deats in bookplates. The first is his personal bookplate (on the left). The bookplate was designed by Edmund Henry Garrett. 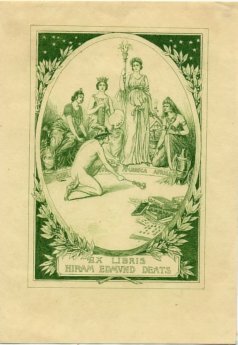 The bookplate shows the Greek deity Hermes bowing before four women representing four continents. On the lower right of the bookplate is a group of books including a stamp album. A copy of the bookplate is included in the collection of the Rare Book & Manuscript Library of the University of Illinois Champaign-Urbana. [Note: This bookplate also exists in a reddish color. Deats had at least three other personal bookplates at various times in his life.] 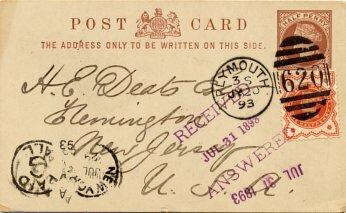 The second artifact (see below) is a postal card mailed from Plymouth, England to Deats at his home in Flemington, NJ on July 20, 1893. The postal card was mailed by W. H. K. Wright, Secretary of the Ex Libris Society in London, England (which became defunct in 1908) and Editor of the Journal of the Ex Libris Society. Wright covers two topics in his message on the postal card to Deats. The first topic relates to the book Ex Libris Imaginaire which he has purchased for Deats from its author L. Joly of Paris, France. 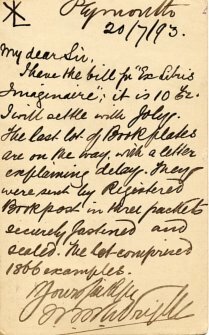 The second topic concerns a lot of 1800 bookplate examples which Wright has sent to Deats in "three packets securely fastened and sealed". Wright refers to this lot of bookplates as the "last lot" which indicates that previous lots had been sent. I came across an entry in WorldCat for a publication authored by Deats titled The collection of American and foreign bookplates of H. E. Deats ...sold 1909. A microfilm copy is located in the New York Public Library. More about the philatelic and library connections of Hiram E. Deats can be found in this article in the American Philatelist. I also have a page on the Library History Buff website with more information about Deats. This week, in preparation for a library construction project, we will be moving books with call numbers U – Z, and folios, to storage for a few months. USF students, staff and faculty will be able to request books from storage using the “request it” link or “request” button in the library catalog (see screenshots below). Requests will take approximately 5 days to arrive at Gleeson. These books will check out for usual loan periods. Thanks, and if you have any questions, please feel free to contact us! 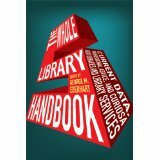 The American Library Association (ALA Editions) has just published The Whole Library Handbook 5 edited by George M. Eberhart. Like its four predecessors this encyclopedia of library information contains an unbelievable amount of useful and interesting information about libraries and librarianship. I highly recommend it. As a library history buff and collector of librariana, I am especially appreciative of the many items in the handbook that relate to library history. Not to mention an entire section on "Librariana". It, of course, also includes up to date information on library statistics, technology, and dozens of other topics. The handbook would make an excellent text for an introduction to librarianship course in library schools. The handbook can be used as a reference source for all kinds of elusive information about libraries, but it can also just be read as an entertaining overview of our library profession. The material contained in this edition according to Eberhart is 98 percent new or substantially revised from previous editions. I have all of the previus editions and continue to find them very useful. The first edition contains Eberhart's article on "Biblio-philately" which had a life changing impact on me. It was the stimulus for my becoming a collector of postal librariana which led in turn to my becoming a library history buff and ardent promoter of library history. I was pleased that my article "Bibliophilately revisited" was included in the third edition of the handbook. I also have an article on postal librariana in the fourth edition. In each edition, Eberhart has invited a collector of library postcards to pick out their ten favorite library postcards. I was honored to be asked to take on this task for the fifth edition. The Whole Library Handbook 5 has two "Web Extras". One is a list of 100 great libraries of the world and the other is a compilation of libraries and librarians in film and TV. “Recently, the Education Department issued a controversial ‘blueprint’ for dealing with sexual harassment that could expose colleges that follow it to First Amendment lawsuits and redefine every flirtation and request to go out on a date as potential sexual harassment. It rejects decades of court rulings by declaring that any unwelcome speech or conduct of a sexual nature is harassment, even if it would not offend a reasonable person. “By defining speech as reportable ‘sexual harassment’ even when it does not offend a reasonable person, the Education Department has cast a dark cloud over academic freedom and the ability to debate important issues about sexual morality, norms, and roles that may offend some listeners.” Read the full article in the Chronicle of Higher Education. The Library provides access to The Chronicle of Higher Education to all USF faculty, staff, and students. The Chronicle of Higher Education is the No. 1 source of news, information, and jobs for college and university faculty members and administrators. The Chronicle is a nine-time finalist for the National Magazine Awards, and one of its columnists was a finalist for a 2005 Pulitzer Prize. The Chronicle has also received honors from the Education Writers Association, the Society of News Design, the EPpy Awards, and the Webby Awards, among others. In 2007 The Chronicle was ranked in the 10 most credible news sources by Erdos & Morgan, a widely used survey of thought leaders in the United States. The Utne Reader that year named The Chronicle for “best political coverage” among independent newspapers. Great year Dons! And Don’t Forget, We’re Open this Summer! Have you seen the library’s letter of gratitude to graduating student assistants? Stop by and see the letter, as well as a display of the books that have been dedicated to these students. We’ll miss all of our student assistants and student users over the summer. If you’re taking classes and/or hanging out in the city, though, we’ll be open so please come on by!